The Science in Action cadet camp is back after the pilot project's success last year, and it's returning bigger and better in 2017. Find out how drones are helping the Army’s battlefield surveillance and information gathering and honing your drone flying skills. Learn about the Army's high-tech aerial surveillance systems, thermal imaging sights, radars, guns, and precision rockets and discover how you could one day FIND and STRIKE the enemy. Find out first-hand how the Army uses its construction engineering skills to assist the infantry or Armoured Corps and to rebuild vital infrastructure post-conflict. Thanks to the success of last year's camp there are 160 places available (compared to 70 last year). ACF or CCF(A) cadets in Years 10-13 at school or college should apply now (the deadline for applications is 22 September) for this year's camp, taking place at West Down Camp, Salisbury Plain from 22-27 October 2017. 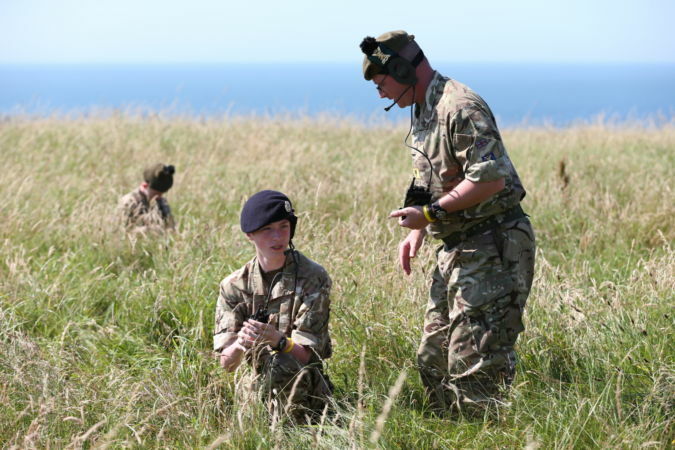 The camp, run by the Royal Artillery with input from technical experts, civilian professionals and teachers, will combine theory with practical sessions and give cadets a real insight into how the Army uses STEM in its day-to-day work of defending the nation. Royal Signals – demonstrating a range of state of the art military communications equipment and the latest cyber security initiatives. Royal Artillery – discussing the use of Unmanned Aerial Vehicles (UAVs) for battlefield surveillance and information gathering, along with a practical session operating drones. Royal Logistics Corps – showing how the Army is sustained in the field, including munitions, fuels and an explosives demonstration. Royal Electrical and Mechanical Engineers (REME) – showing how modern equipment is recovered and repaired. Army Air Corps – discussing rotary wing (helicopter) flight. Royal Engineers – providing insights into how military engineering can keep an army mobile, including the use of bridging equipment. Who can apply: ACF and CCF(Army) cadets in Years 9 and 10 and 11 to 13, studying STEM subjects at school or college at GCSE (or equivalent) or higher, although other cadets with an interest in science and technology can apply. Cadets will be split into two groups (Year 9 and 10 cadets and Year 10-13 cadets) based on age and STEM knowledge. How: Cadets from all parts of the UK are invited to bid for a place now. Ask your Detachment Commander for an Application Form and further details. Cadets should complete the STEM Course Application Form distributed down the Chain of Command, this is submitted through their Unit HQ to the Bde HQ who will then submit bids in a Brigade order of merit to HQ Regional Command. Adult volunteers should submit their bid to assist with the STEM course through their Unit HQ to Bde, stating the STEM related areas in which they have experience.